Looks as if I need to be doing paintings of fruit, vegetables, slimfast, etc. This time of year I start to feel the tug of jeans that are too tight and shirts that have become too snug. I'm sure this extra weight is due to inactivity and painting all the time. Painting these cute little cupcakes isn't helping either. Getting out in the garden during the spring and summer usually gets me back into shape pretty quickly because I'm not inside with the frig. Hurry up Spring!! 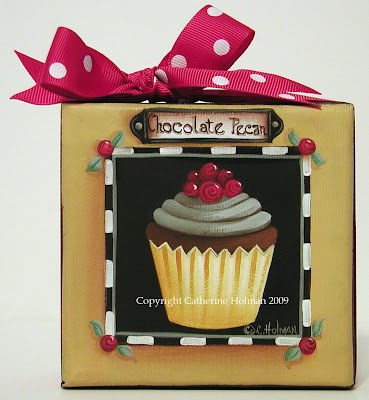 This cute little "Chocolate Pecan Cupcake" is now listed in my eBay auctions. The bow is bright red even though it may appear to be hot pink in this photo. This yummy chocolate pecan cupcake is filled with chocolaty, nutty goodness. Decorate your kitchen with this cupcake piled high with mint green frosting topped with red roses. The border is painted a pale yellow and is accented with black and white checks and tiny red roses. A black tag is painted at the top labeled "Chocolate Pecan". 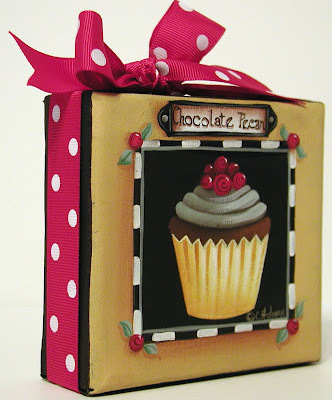 A bright red grosgrain ribbon with white dots is wrapped around the edges of the canvas and tied in a bow at the top. When a gentle breeze is in the air, people walking down Greenbriar Lane and neighbors with open windows, are entranced by the sweet scent of Miss Effie's flowers. She has won first prize at the county fair the past two years for her beautiful pink roses. She loves to teach the neighbor children how to garden and treats them to lemonade and orange frosted cookies for their help. Miss Effie is then showered with hugs and kisses. Oh the cupcake painting is to die for! It is so cheerful! I think I know Greenbriar Lane, it is just up the road from where I live. At least a town by that name is and I am sure I've seen yellow house very similar. Love it! Thank you for your sweet well wishes! I am hoping to be able to travel soon to my aunts for the house photos. I have a couple but they are not very clear. I will be in touch as soon as I can get them. I ended up having pneumonia so I am not up to snuff yet but I am praying towards it! Yumm Yumm Yumm! 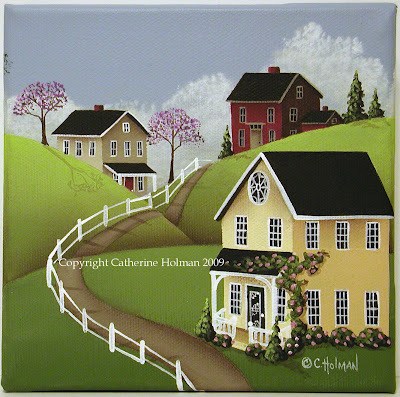 Love your work Catherine, you are so talented! The pink of the ribbon and the little berries on the cupcake are so gorgeous! I know the feeling of realizing that winter has caught up to you. I'm so glad spring is upon us so I can get out of the studio more often too. The neighborhood looks ready for spring! Such a sweet one it is.